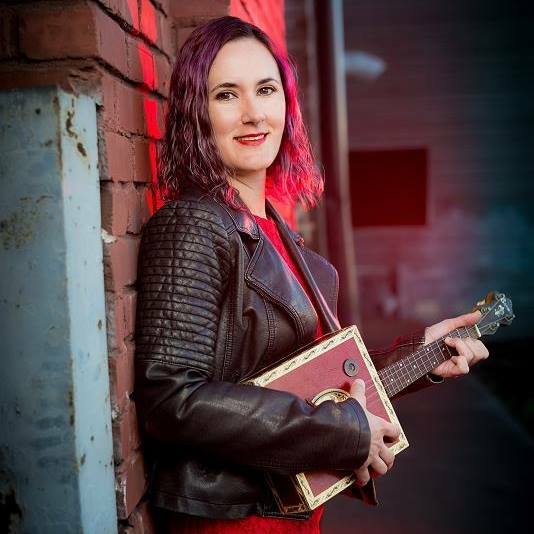 Amy Bleu is a singer/songwriter/guitarist/ukulele player based in Portland, Ore. Born in Eastern WA and raised primarily in Hawaii, Bleu grew up on the road, hearing relentless melodies and accompanying stories in her head. She fiddled around with the ukulele as a child in Hawaii, but didn't discover her true love - the guitar - until she was 19. She honed her guitar skills at shows in the Northwest, then relocated to the Southwest to promote her music in a new region. Two albums later she returned to Portland and picked up the ukulele again. Amy then teamed up with Adam Sullivan to produce her third album, Geek Love. The album featured Sullivan on many instruments including the accordion, and was the first album to feature Bleu's husband, Matt, on bass guitar. The three of them began to perform live together as well. In 2010 they recorded and released a five-song EP, titled the Unholy Loves. More recently Amy released her fifth CD, an E.P. titled Not the Girl Next Door. Bleu toured solo from March until September of 2012. She is currently back in Portland, performing locally and learning to play the auto-harp.